Is your yard ominously looking like a Hitchcock movie? Birds such as sparrows, blackbirds, pigeons and crows bring problems and can disrupt the harmony of your property. The P7831 Birdchaser is a humane and easy way to keep these pests away. 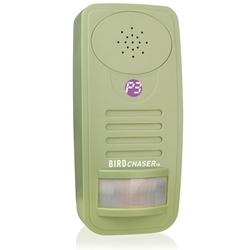 The Birdchaser uses a built-in PIR sensor to trigger two types of audio repellants. The first is a recording of predatory bird sounds (hawks, falcons & owls) that is loud enough to frighten away invaders who come within range. The other setting is a ultrasonic sound that is irritating to birds and inaudible to humans. It is easy to install and adjust settings depending on your preference. It is ideal for farms, yards, orchards, gardens and public buildings where unwanted birds tend to flock. Current: Standby = 1mA max. Detection distance: 8 yards max. Bird chaser sound level: 105 dBA at 1 ft. max.